March 27, 2018: This post was originally published on February 17, 2018. The AppTip Sheet that I described here is no longer accurate. It refers to the website, http://360Facebook.com. It has been replaced by a new website, http://nadirpatcher.com. This new site performs a similar function as before, but also includes additional capabilities. I refer the readers to my later post. I have a new format that I use to help me do certain tasks on my computer or other devices. I named this format AppTip Sheet. For example, these AppTip Sheets may be the steps involved to accomplish a particular Photoshop editing technique, or how to use a particular Photoshop tool. Or, they may deal with various steps I need to perform in flying my DJI Mavic Pro drone, or how to perform a particular calibration on it. In general, I write these AppTip Sheets to document any thing that I do not do routinely enough to remember each and every step, but yet do them often enough that a quick cheat sheet helps me avoid pulling out the manual or other document to complete the task. The key is that I try to keep these AppTip Sheets as short as possible. Occasionally, I may decide that a particular AppTip Sheet may be useful to others, and so I will post it here. Right now, I am experimenting with using my Mavic Pro flight modes to take 360-degree Spherical panoramas for posting on social media. Once posted, you can use your mouse to zoom in on the subject and pan around throughout the entire scene. That is the subject of this post. This particular AppTip Sheet deals with posting a spherical panorama on Facebook using 360Facebook.com from the browser on your PC. This is only one of the several ways to accomplish this, and I will explore others in the future. So click on the figure below to get a better idea of what these AppTip Sheets are like. In my previous post, I linked to a 3D panorama I had shot from my DJI Phantom 2 Vision+ drone. In this post, I am linking to a video that demonstrates how I did it. It was a multi-step process, but producing the 3D panorama only uses a couple of free Microsoft programs, which are easy to use they way I did. By the way, my example uses a sequence of six shots that I took from my Phantom, but they could have just as easily been shot from my hand-held camera. 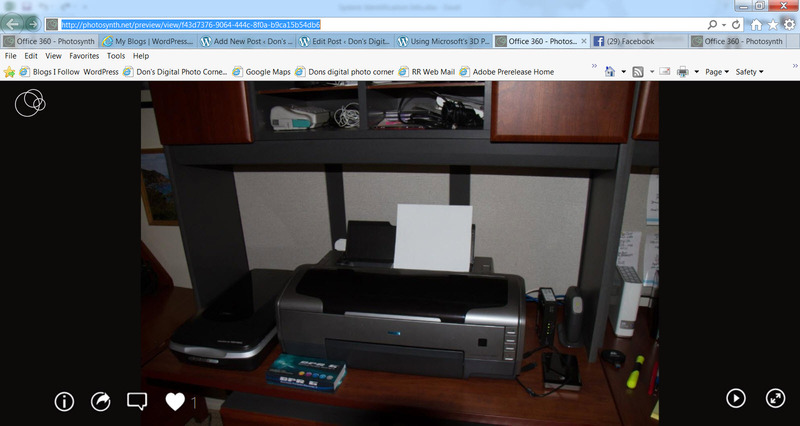 The YouTube video does not include audio annotation to show just how easy it is to create the 3D panorama. Click on the image below to watch the demo. The panorama was shot from above yet another huge soccer complex across the street from the Silverlakes Soccer Complex in Norco/Eastvale CA. Silverlakes can be seen towards the end of the video. 2-27-17: Please note, Microsoft has removed Photosynth, so the link referred to here is no longer valid. They have provided a Photosynth Viewer, as of right now, I not determined an effective method to link the viewer with my downloaded .pano files. I am currently reviewing alternate ways to produce and display 3D or VR panoramas. Please stay tuned. Click on the link below to see the final 3D panorama. Using the scroll wheel on the mouse, zoom in and pan around. There is a tremendous amount of detail captured in the photo. Please let me know in the comments below if you have used these two programs to produce your own 3D panoramas. How did they work for you? There are other programs available that can produce similar and often superior results. Have you used them? Finally, please click on the Like and share this post with others if you think it has been helpful. I have been shooting RAW images with my camera for over four years now. Thus, I am very comfortable using the Adobe Camera Raw (ACR) editor in both Photoshop and Photoshop Elements. I also take a fair amount of videos with my digital camera, which always need some sort of editing. 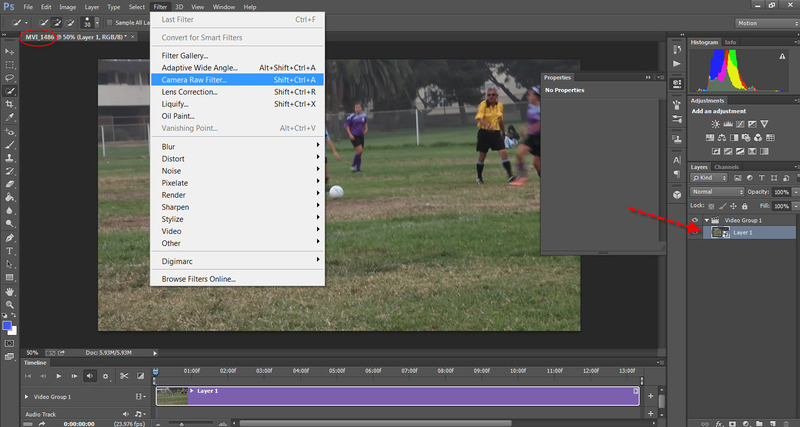 I generally use Adobe’s Premiere Elements of Microsoft’s Movie Maker as my video editor. For a while now, Photoshop has been able to edit video clips, but I have not really made much use of it. However, Photoshop CC has taken its video editing capability to a new level that is quite intriguing to me. In Photoshop CC, if you import a video clip and then turn it into a Smart Object, you then can edit the clip using the Adobe Camera Raw as a filter. Doing this I can use the same tools and sliders that I routinely use on my still images to edit my video clips. By converting the clip to a Smart Object, every frame is corrected rather than just the first frame of the video. Below the before and after example of my first attempt at correcting a video clip in this way. The original was shot in lighting that resulted in the video having low contrast and no real snap. I corrected it as described above. I only made a subtle change using the ACR, but it did improve the video. This certainly warrants more investigation on my part. Also, can I get the same or better results using Premiere Elements or Movie Maker? Have of you tried this approach? What did you think of the results?